This article was originally seen on the Taiwanese website of the magazine Business Weekly, written by Joey Chung. I thought it was a good take on Taiwanese society, our politicians and media, so I translated the article into English and decided to share it here. Last week, my editors at Business Weekly invited me to write a piece about Jeremy Lin. Their reasoning was that he went to Harvard and so did I, and technically we were both attending the school at the same time. As such I should have some unique viewpoints to share. Personally, I really dislike this attitude of the Taiwanese media: whenever someone or something becomes trendy or a hot topic, everyone needs to have an opinion on it. No matter where you happen to go, everyone wants to talk about the topic, every radio and television station has to discuss it. Do I have anything unique to say about Linsanity? No. Honestly, I wasn’t in a rush to write this piece. I am just like anyone else, I am very happy to see him win basketball games, really excited to see him play on TV, but my viewpoint on him doesn’t have anything unique to it. Yet, my editors were insistent. They said this was the hottest topic in Taiwan, and it was difficult to find another Harvard graduate who went to school at the same time to discuss this topic. OK, if I really wanted to write about Jeremy Lin, I want to make sure this will be different from describing the phenomena or reiterating what others have already pointed out. The truths that we do not want to know about Jeremy Lin. We need to stop lying to each other and to ourselves. He is American. His family is from Taiwan, but like many American citizens, he is from an immigrant family, born and raised in the United States. We all know deep down that although his grandparents still live in Taiwan, Taiwanese society, physical education system, and government had almost no influence on his success. Out of cultural pride and perhaps a lack of confidence in the international arena, Taiwanese proudly associate with him as if he left Taiwan only yesterday. That is fine, but how can Taiwanese politicians and media so casually refer to him as the Pride of Taiwan? Can we not be so generous with ourselves? Taiwan did not contribute to his current achievement, so we shouldn’t so quickly and easily share in his success. This might be the most important point. Taiwanese parents will use Jeremy Lin as a role model of hard work for their children. Schools will use him as an example of hard work paying off. Yet we all know that the truth is, if his parents stayed in Taiwan and adhered to the strict rules and norms of education present in Taiwan, he will have never reached where he is today. An inflexible education system will have forced him to choose between basketball and academics when he was in 7th grade. The mentality in Asia is that the two are incompatible. If you chose sports, you will almost immediately be labeled as bad at academics. Your entire life becomes preset, and Jeremy Lin’s success at sports might have been limited. He also will not make much before becoming a high school physical education teacher. If he chose academics, then from the age of thirteen to twenty-two, the Taiwanese education system will advise against his pursuit of his passion and rare natural talent. Instead, it will keep telling him to keep studying and score well on exams. The world will never see his talent and after several years, the fans, ball clubs, or sponsors also will not profit from his success. Harvard is special, because like other Ivy League schools, their academic requirements for student-athletes are the same as other students. Unlike other American universities that hand out full-time scholarships and enrollment based on pure athletic ability, Harvard student-athletes must meet the entrance requirements. This is also why traditionally, Ivy League schools aren’t strong in athletics and can’t truly compete with the other schools. Just from this fact, Jeremy Lin, being from an Asian family and graduated from Harvard, could still shine in the NBA is extraordinary. He wasn’t forced to give up his talent in either areas and successfully proved that academics and athletics can coexist. In addition, Taiwanese parents love to use him as an example. Let’s face reality. The average Taiwanese parents, when they here that their son wants to become a professional basketball player, they will immediately furrow their eyebrows. Especially if he graduated from Harvard, this decision will be ridiculed by other parents and relatives. As a Taiwanese, the best thing we can be glad for Jeremy Lin is that he successfully left Taiwan. Otherwise he never would have had the resources and environment to achieve so much. During Jeremy Lin’s first winning streak, I happened to be in Taipei on the weekend. Everywhere I went, newspapers, magazines to talk shows on television were all discussing issues like: how to find the Jeremy Lin in your organization, how to become the Jeremy Lin in your industry, or what the Taiwanese education system could learn from Jeremy Lin. Is there any meaning to this? Most of the sentences aren’t even logical. 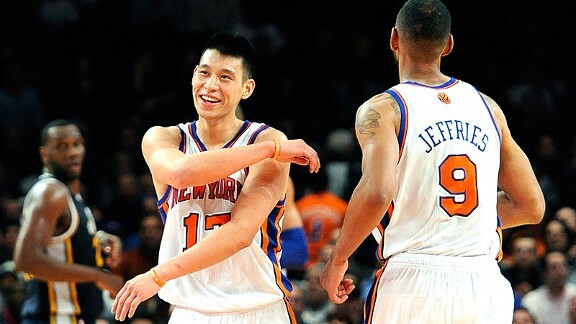 They are just politicians and media using easy, lazy, and sometimes even irresponsible ways to profit from Linsanity. They use your insecurities to hold your attention, whether it is to sell more newspapers, magazines or to make the politicians look more cool. For example, how to find the Jeremy Lin in your organization really just means how to find the member in your organization who is overlooked but has potential. If you are a medical supplies manufacturer, does Jeremy Lin have anything to do with that label? Do you seriously believe that by reading a piece about how to become the Jeremy Lin of your industry will suddenly make you a superstar and achieve a 200% growth in sales overnight? Without discussing or thinking about how his childhood, family and education environment and what is it that really made him successful? As a member of society don’t be so easily fooled and agreeable, only because someone put Jeremy Lin on the cover or used him in a speech, to parting with your hard-earned cash. When I was younger, I didn’t understand what he meant. Why are war movies better when it is more violent? Why does the direct have an obligation to society? As I grew up, I slowly came to understand his quote and the wisdom behind it. Don’t misunderstand me. It is exciting to see Jeremy Lin on television. As an Asian, we are cheering for the fact that another Asian is proving to the world that we can succeed and deserve respect at more than just the fields of IT, engineering and academics. When the game is over, when the applause stops and we return to our lives, if we can extend time a little and think about things other than what is discussed so superficially about Linsanity, we can truly understand which part of his success is really of value to us and use it as a mirror so that we can admit to ourselves which part of our own lives needs improvement. Everyone knows that to improve, we first need to admit the truths that we don’t want to face. Why can Jeremy Lin succeed in the States but not in Taiwan? Why can his parents develop his talents and support his passion, unlike other Asian parents? Where can Asian education and social mentality change or improve so that other Jeremy Lins can start to emerge in other industries on the international stage? This is an important first step. If we want to translate his success on the basketball court into our daily lives, this is what we must do. Now turn off your computers and go play some ball.